I’m vacationing at my sister-in-law’s house in Front Royal VA and have been doing some “Deck Side” reviews. Well, a late day thunderstorm forced me inside for this none. I received this as a birthday present from my friend Bob. I have had this before but just at tastings. I don’t think I have ever had a full glass or bottle so I’m really looking forward to this review. The beer pours a hazy golden yellow with a bright white head. The nose is classic Belgian Wit: sweet light malts with citrus notes on a yeasty background with little to no hop presence. This is a very inviting nose. AHHHH what a great first sip; clean and refreshing with just a hint of citrus notes. The taste starts out with light sweet wheat malts up front, then the most pleasant cleansing effervescence over the tongue through the middle of the sip. The back-end is extremely easy drinking with an effortless swallow. There is a yeastiness and earthiness building up during the swallow. 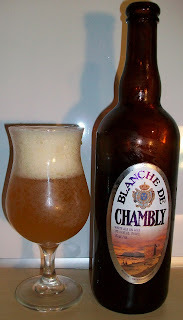 The finish is classic Belgian Wit; light clean and refreshing with a hint of citrus and spice. There is just a slight aftertaste of lingering wheat and yeast. Wow, what a nice Wit. I have had this before but just at a tasting. This is the first time that I’ve had a full glass. That was so light and refreshing the first glass is gone. It’s a good thing this is a 750 bottle. I need to have this one head to head with Blanche De Bruxelles. I’m really not sure which one I like the best. They are both very nice Wits, clean and refreshing. This is a solid A maybe even an A+. What a great clean and refreshing Belgian Wit with classic notes of citrus a hint of spice all on a wheat background.